By combining different experimental set-ups we track the dynamics of solids and solid-like materials in the enormous range of about 15 orders of magnitude. In addition we can vary the sample temperature continuously in a range from 4 to more than 500 K. This allows us to study the reorientation of molecular dipole moments and the transport of ionic charges over wide intervals. The excitation of the sample is by voltage steps, harmonic fields, as well as by electrical noise. Our main interest is to study the temperature dependence of rotational and translational correlation times as well as their distributions in order to gain microscopic insights into motional process in condensed matter. Most of the experiments in our laboratory are performed in the linear regime in which the polarization response is proportional to the electrical excitation. In addition, we developed and applied non-linear techniques such as nonresonant dielectric hole burning. This pump and probe technique is able to distinguish homogeneous from heterogeneous scenarios of relaxation. 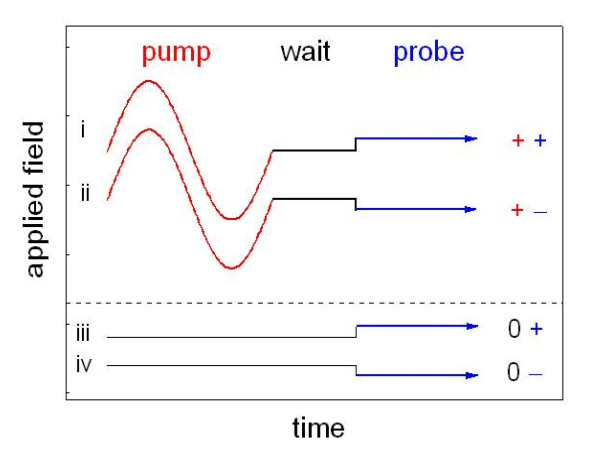 Developed together with Ralph V. Chamberlin from Arizona State University, this pump, wait, and probe experiment is able to reveal whether the broadening of a dielectric loss spectrum is due to a distribution of relaxation times or not. In the latter case the spectrum can be modified by a frequency selective pump employing very strong electrical fields with amplitudes in the kilovolt range. The altered correlation function is probed as the response to a small voltage step. 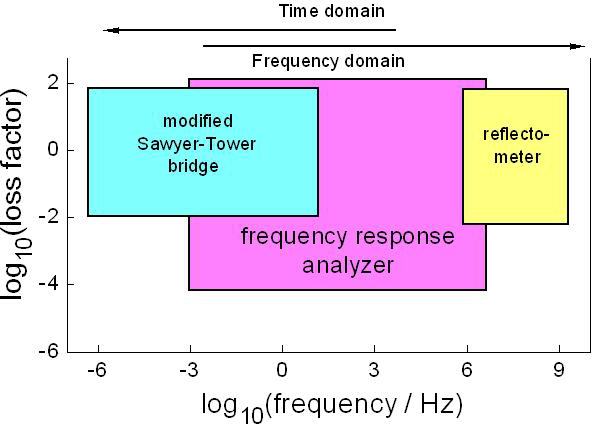 The detection of the modified differential response is based on the shown phase cycle. This experiment can be considered as the low-frequency variant of related optical or nuclear-magnetic hole burning techniques. In combination with appropriate theoretical modeling this experiment has been successful in clarifying the nature of various relaxation processes in systems as diverse as supercooled liquids, relaxor ferroelectrics, orientationally disordered crystals, and ionic conductors, to name a few. 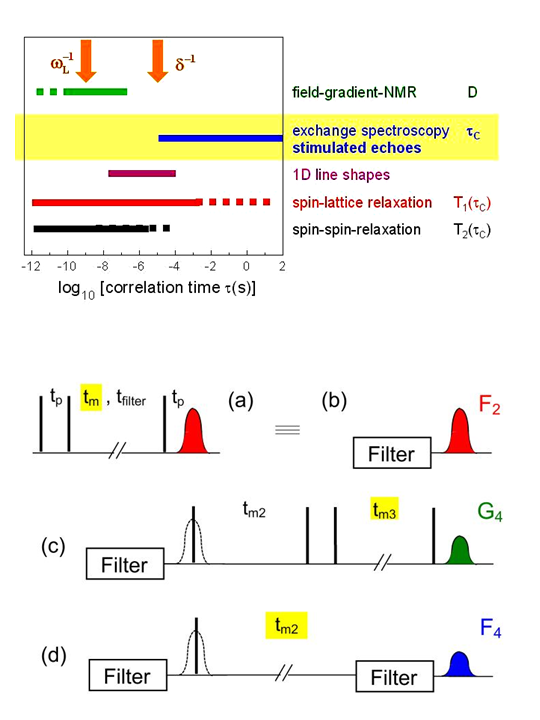 An array of NMR techniques, embracing spin-lattice relaxometry, line shape analysis, two-dimensional exchange spectroscopy, and field-gradient measurements is used in our laboratory to study the rotational and translational motions in solids and solid-like samples. This gives us access to a wide range of time scales which we study in a temperature range extending from 4 to 500 K. We are equipped with several dedicated high-power and commercial spectrometers. Recorded as a function of the mixing time tm the two-time correlation function F2 provides direct access to motional times scales. At a fixed mixing time this 3-pulse sequence can often be regarded as a low-pass filter which selects molecules or ions which did not move during tm. Using a fourth pulse the magnetization can be stored for latter use. The two-time correlation of the selected subensemble is tested via the G4(tm3) function. Another four-time correlation function is obtained by using the same low-pass filter twice. It enables us to detect whether the correlation time of a molecule or ion changes during the time interval tm2 and has given valuable information on dynamical heterogeneities in glass-forming materials and ion conductors. 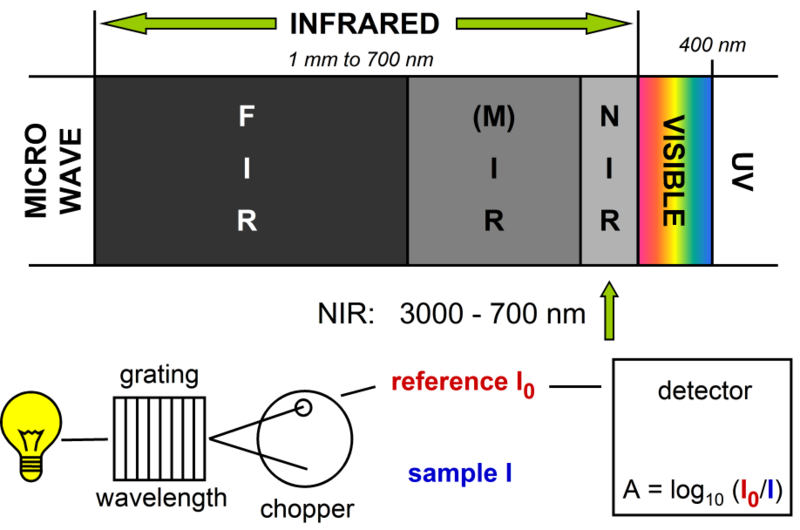 The spectral region beyond the long-wavelength end of visible light (near infrared: 3000 to 700 nm) can be exploited to study vibrations of OH, NH, and CH groups within liquids and solids. By investigating the intensities and frequencies of these vibrations access is provided to the relative number and the sizes of various hydrogen bonded associates for a wide temperature range. The consequences of diluting H-bonded networks with (non-) polar solvents and the resulting degree of hydrogen bonding can be monitored directly in the near-infrared region. Using time-resolved near-infrared experiments we map out slow H-bond exchange dynamics.